Strong passwords are an important way to protect your corporate and private data from theft – and to avoid joining the more than nine million Americans victimized by identity theft each year. Jennifer Lawinski, a contributor to eWeek, quoting Darya Gudkova, head of content analysis and research for Kaspersky, emphasizes the need for strong passwords. She recommends long passwords with a mix of different characters and letters. She also throws in several different languages to make her own passwords even tougher to crack. How do you create a bulletproof password that hackers can’t crack? These tips from myID.com can help you set passwords that will keep your data stays secure. Ban the Basics — Never use words found in a dictionary, even written backwards, in another language, or with a simple number following. Personal Is Predictable — Anyone who knows you could guess your password if it uses your name or username, birthday, pet or favorite team, band or movie. Size Matters — The longer the better. Passwords should be at least 8 to 14 characters and mix upper case letters, special characters, and numbers. Sell-By Dates — Change passwords for online bank or credit card accounts every 1 to 2 months; others are good for maybe months. Mark your calendar. 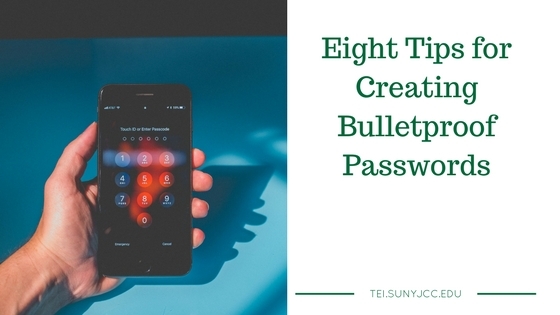 To Each His Own — Don’t use the same password or similar patterns (word plus repeated number, for example), so one cracked password doesn’t unlock all accounts. Keep it Secret, Keep it Safe — Don’t share passwords or store them on your computer or mobile device. The best place to store them is in your head or a locked safe. Password Is Not a Password — If the admin sets it to password, change it fast.